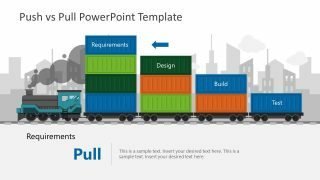 The Logistics Business PowerPoint Diagram is a template for supply chain management concept presentations. 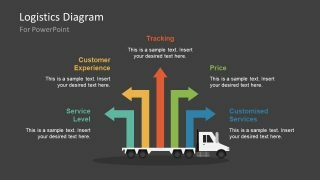 It is a 5 steps PowerPoint diagram containing a logistic truck shape. First off, the flatbed back section of truck contains five chevron arrow shapes. These are 5 independent segments pointing to the different directions. It could demonstrate various concepts of global shipping and distribution warehouses. Each segment has a distinct color representation. 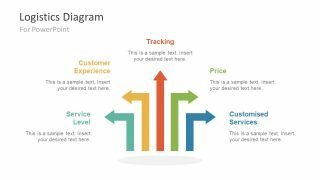 This template initially displays five stages of customer service process including service level, customer experience, tracking, price, and customized service. These are the phases of business logistic service and customer segmentation. 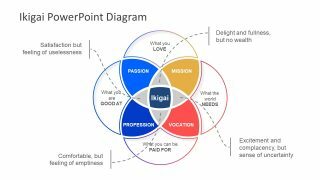 The Logistics Business PowerPoint Diagram has 4 slides to present concepts ranging from ERP, distribution, inventory, and shipping. It may also include the processes of supply chain management. The supply chain management refers to the network of companies working together to deliver a product or service. Whereas, the logistics are a set of activities within one organization. These activities include procurement, maintenance and inventory management. The delivery and shipping companies like FedEx, DHL, UPS, now amazon’s package delivery company, all are operating on logistics activities. 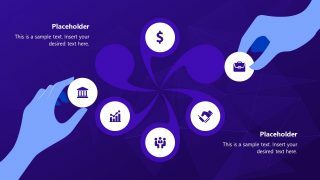 The core function of such businesses is, to efficiently deliver a right product to the customer in its original condition. Therefore, the chevron segments of logistic diagram can help list the products or services provided by shipping company. 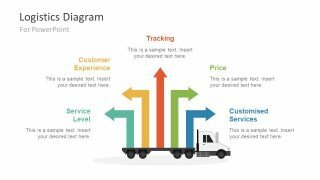 The cargo truck clipart can assist in illustrating the delivery of valuable service to customers. Just like a package delivery. 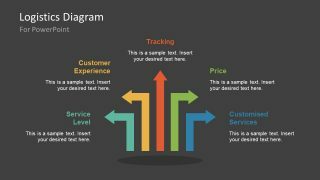 The PowerPoint diagram template of logistics provides the option of two layout designs. One, with flatbed cargo truck which shows 5 segments instead of shipping container. And, the simple set of 5 chevron segments creating a semi-circle in multiple directions. Further, the template gives two background color options to chose from. 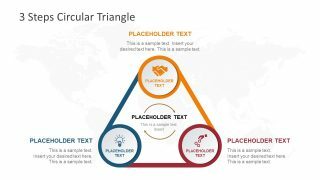 However, the users can customize these backgrounds, as well as the shapes and text placeholders according to their presentation requirements.